I’ve seen those special muffin top pans, but am simply not impressed. It’s one extra bulky item to store in my little kitchen that basically produces stubby muffins. For the upcoming loved one “holidays” I wanted that true crusty muffin top experience – just lightly fluffy in the middle, like a tender breakfast cookie. And that’s exactly what these vanilla chocolate chip muffin tops are. Of course I thought about creating a new pancake recipe for Mother’s Day, but that topic seems a little overdone. Muffins popped into my head next, but why not just make the best part of the muffin (in my opinion) for a very special treat! And since I think most of today’s moms enjoy special indulgences, but feel good when they keep things healthy, I decided to make these chocolate chip muffin tops with some nutritious ingredients. And naturally when we talk about luxury and health, chocolate comes to mind, right? Chocolate chip muffins are both Tony’s and my moms favorite flavor (the vanilla part is for me! ), and in addition to my prior post on the health benefits of chocolate, some more studies have emerged this year to help you pick the best dairy-free chocolate. I love that you get TWO muffin tops rather than a muffin top and bottom. 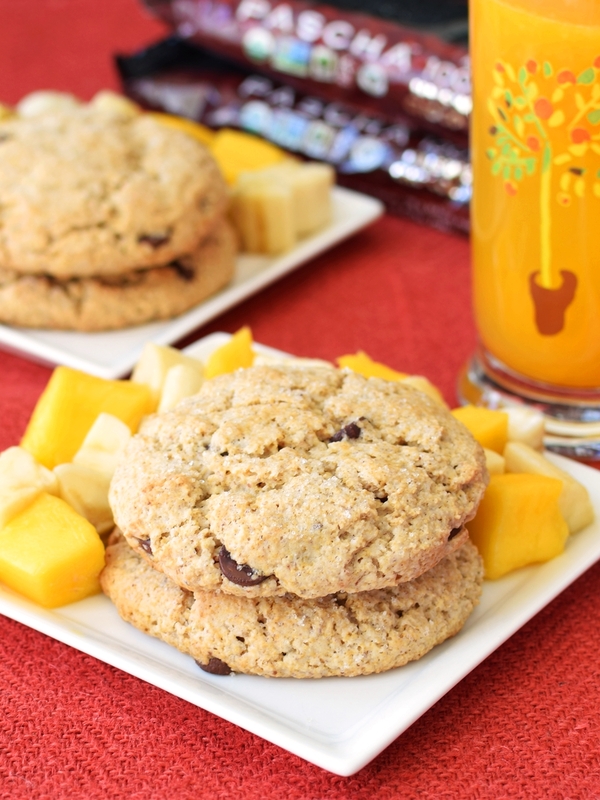 For a breakfast in bed treat, I serve these chocolate chip muffin tops with cut fruit, fresh-squeezed tangerine juice and nut butter for “frosting”. It seems that the cacao percentage shown on the front of chocolate packages directly correlates to the amount of health-promoting antioxidants (the more, the better). Also, the darker the chocolate, the more it promotes satiety. For these chocolate chip muffin tops I use PASCHA Organic Chocolate Chips because I can mix and match the percentages. They offer 55% (which has a milky vibe), 85% (a big jump up in antioxidants and intensity, but still smooth), and 100% (for you cacao purists). For Tony, I go all 55%, but for loved ones with less of a sweet tooth, I do a combination of the 55% and 85% or just go all 85%. 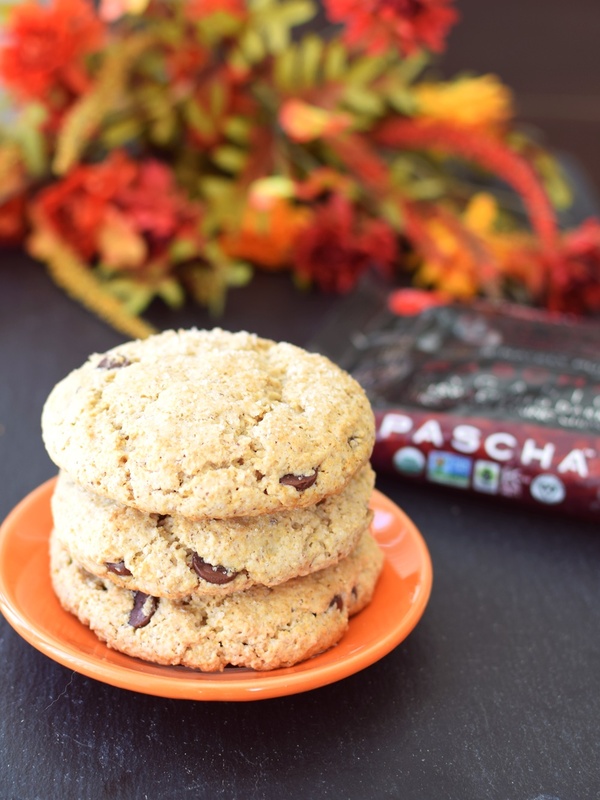 To note, PASCHA Organic Chocolate is made in a top allergy-friendly facility (no dairy, egg, gluten/wheat, tree nut, peanut, soy, or sesame present), is Certified Gluten-Free, Certified Vegan, Certified Paleo (the 100% options), Non-GMO Verified, Certified Organic, Certifed Kosher Pareve, and they Give 1% Back for the Planet. They pull out all the stops – can you see now why I love working with and using this brand??!! This post is sponsored by PASCHA Organic Chocolate, but the love for muffin tops, their chocolate, and this recipe are definitely my own. 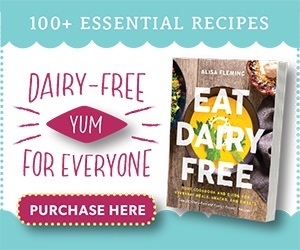 By ingredients, this recipe is dairy-free / non-dairy, egg-free, gluten-free, nut-free, peanut-free, soy-free, vegan / plant-based, vegetarian, and generally top food allergy-friendy. Need a Margarine Sub? We like the buttery flavor in these chocolate chip muffin tops and the ingredients are pretty darn good in the margarine brand that I use, but you can sub in melted coconut oil, if preferred. 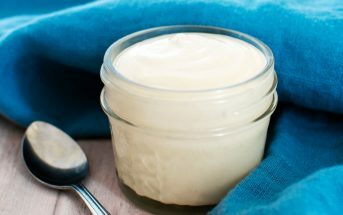 Just make sure to bring your dairy-free yogurt to room temperature, and you will probably need to chill the dough for at least 15 minutes before mounding onto your baking sheet. Lower Glycemic? I use an organic cane sugar, which many people consider “unrefined”, but you can sub coconut sugar or your granulated sugar of choice in an equivalent amount. It will affect the overall flavor and sweetness a touch, but you can adjust with a little more or a little less, if you like. Okay with Wheat? 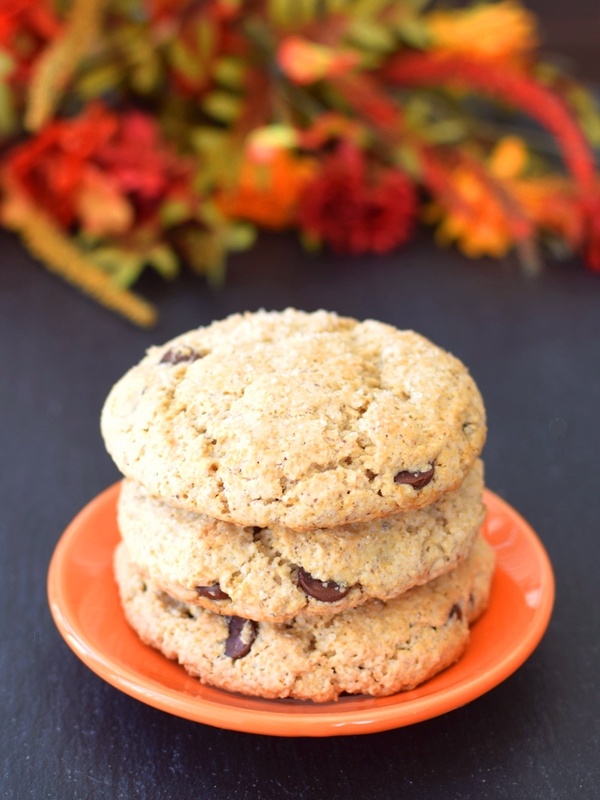 I like baking with oats, but you can certainly use all-purpose flour, whole wheat pastry flour or white-wheat flour in this chocolate chip muffin tops recipe. Use 2 cups in place of the oats and starch, and you can omit the flax seeds, if desired. Prefer Eggs? I haven’t yet tested this chocolate chip muffin tops recipe with eggs, but in theory, you should be able to sub 2 large eggs for the dairy-free yogurt. This will decrease the sweetness a bit. Want a Flavor Mix-Up? You can substitute mashed banana or pumpkin for the dairy-free yogurt; adjust the sweetness as desired. The pumpkin will make it a little less sweet, while the banana might add a touch of sweetness, depending on how ripe your fruit is. 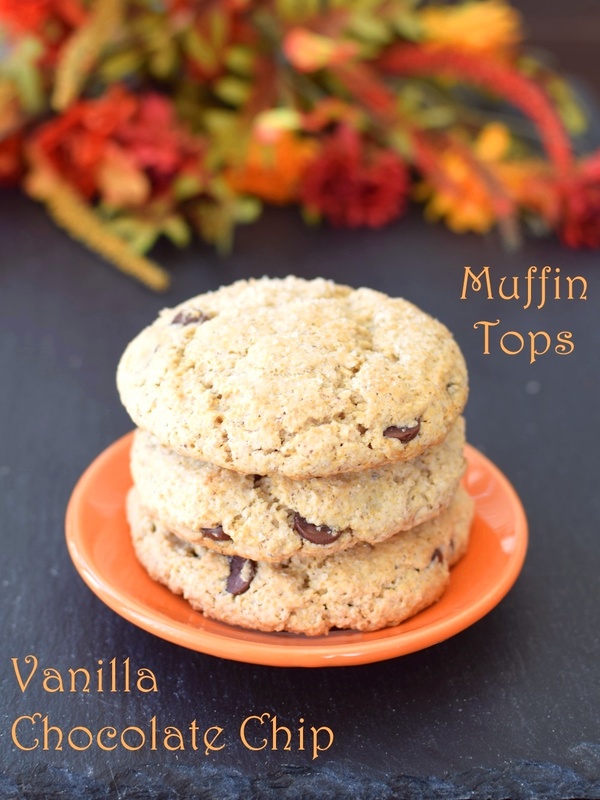 As usual, see my post above for tons of options to modify these chocolate chip muffin tops, including using wheat flour and swapping out the sugar. Preheat your oven to 400ºF and line two baking sheets with parchment paper or silicone baking mats. Place the oats and flax seeds in your spice grinder (or small food processor) and whiz until powdered, about 60 seconds. Add the oat-flax flour, starch, baking powder, baking soda, and salt to a medium bowl, and whisk to combine. In a mixing bowl, beat the yogurt, ½ cup sugar, margarine, and vanilla with a hand mixer until thoroughly combined. Fold in the dry mixture until combined, but do not over-mix. Stir in the chocolate chips. The dough should be a cross between muffin batter and cookie dough. 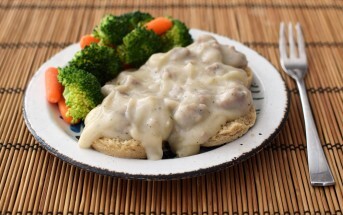 If too soft for spooning, place it in the refrigerator for 15 to 30 minutes to thicken. Scoop dough into 6 mounds on your prepared baking sheet, and using damp hands, shape into domes. They spread a little during baking so go ahead and make those mounds a little tall. Sprinkle tops with remaining ½ tablespoon sugar. Bake (I like to do 1 baking sheet at a time) for 12 to 15 minutes, or until just starting to turn golden around the edges and no shininess is peeking through the top. Let cool for 10 minutes before devouring! Best served warm; can be reheated. These were delicious! Thanks for an easy and yummy recipe! We all loved them :). I followed your recipe and they came out perfectly. Awesome! I’m so glad the recipe was a hit for you Sarah! Oooh, lovely muffin tops! It’s great to have a dairy free option these days! Love love love these! I haven’t heard of that chocolate brand before so I’m definitely checking them out! I usually opt for 85 or 100% The darker the better in my opinion! I think you would love that brand Lauren – as virtuous as it gets and really tasty! I’m actually not into super-dark, but love their 85% – very smooth. I’ve always loved the tops of muffins. These chocolate chip muffin tops look fantastic. Agreed, it’s the best part! I really want to try this out with coconut flour – even if it doesn’t turn out true to form…. I am pretty sure it will still taste amazing! I’d be curious if that worked out! Would definitely need more moisture. The are perfect for my newly gluten-free wife! First off, I LOVE the name. Muffin tops! So creative. 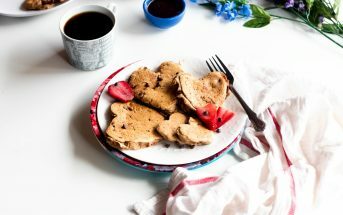 I love this recipe and personally, I prefer using the yogurt or even flax seed meal instead of the eggs. Thank you! I know, sometimes the “subs” are actually the better option – it depends on the recipe. Oh muffin tops, always the best part. This sounds like a fantastic recipe especially the vanilla chocolate chip combo. The vanilla part was key for me! I’m thinking blueberry would go nicely, too. These look sooo good, Alisa. I should be so lucky on Mother’s Day! I had to laugh because I never see muffin tops without thinking of Seinfeld. These cookies look incredibly delicious, Alisa! 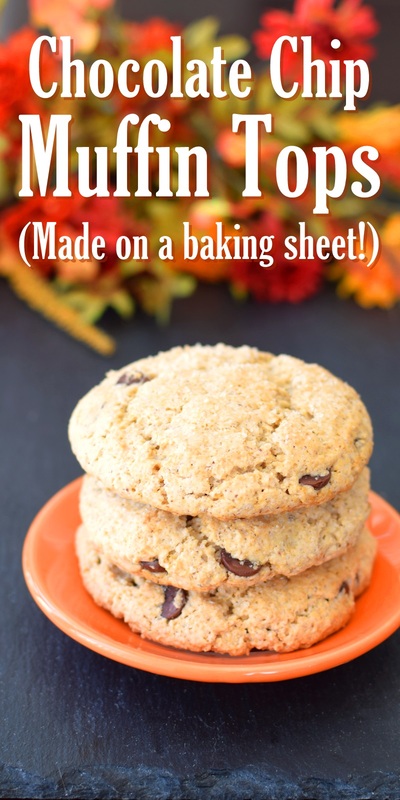 I like that these cookies are so simple to make without buying any complicated ingredients or having to go to many different shops. 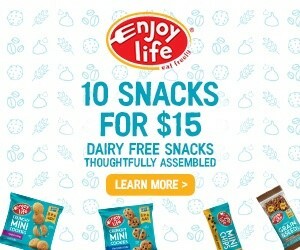 Thanks for the extra special diet tips, they look absolutely delicious! These look SO good!! In high school, my friend and I would always go to Panera and get muffin tops, so I associate them with fond memories 😉 and chocolate chip were always my favorite! I think I’d heard about Panera’s muffin tops – I haven’t tried them, but definitely like the homemade versions! Alisa, I’m with you, muffin tops are the best part (of the muffin.) 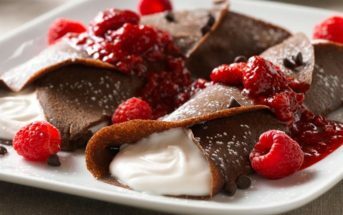 These look so puffy and delectable and love your list of substitutions, so all of us can make these regardless of our dietary preferences and needs. You’ve convinced me to try out this chocolate by PASCHA! These look great and I’m glad you picked this over pancakes! Yes, way better than pancakes 🙂 Yes, you MUST try it Arman – I guarantee it will be your new fav. I LOVE THESE! I am so with you on the muffin top pans- girl got no space for one of those! But, muffin tops are the best part of muffins, so I love that you made these without one! Thanks Taylor! I know, all of the specialty bakeware gets a little out of hand! When I saw these pop up in my Facebook feed just now….I died…they sounds (and look) AMAZING! I am in love, haha! So glad I hit the sweet spot with this recipe Rebecca! adore how you walk through all the ways to substitute because we really are all learning we have to customize our food choices, but don’t always know how!